While visiting Colombia in January, I had occasion to sample a number of delicious, yet mostly unfamiliar, fruits and vegetables. I suspect that botanically inclined Temperate Zone travellers would agree that tropical fruits are one of the great pleasures of travelling in warmer climes. Sadly, I did not have the presence of mind to photograph all of them, or even remember the names of some. Many I wanted to try, but didn’t have an opportunity. 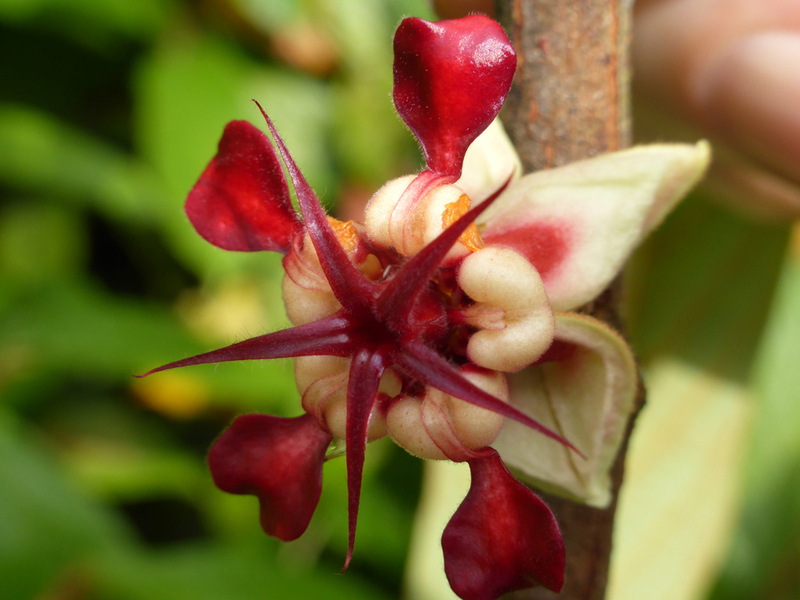 One of the strangest fruits that I did manage to photograph was Theobroma grandiflorum, a close relative of cocoa (see earlier BPotD entries on Theobroma cacao from 2006 and Theobroma cacao from 2009). The photographs were taken in a garden in Quindío Department, one of the coffee-growing areas of Colombia. The species is native to the Amazon basin and widely cultivated in tropical areas of South America. I was first attracted by an amazingly powerful, complex aroma of what I assumed were flowers. 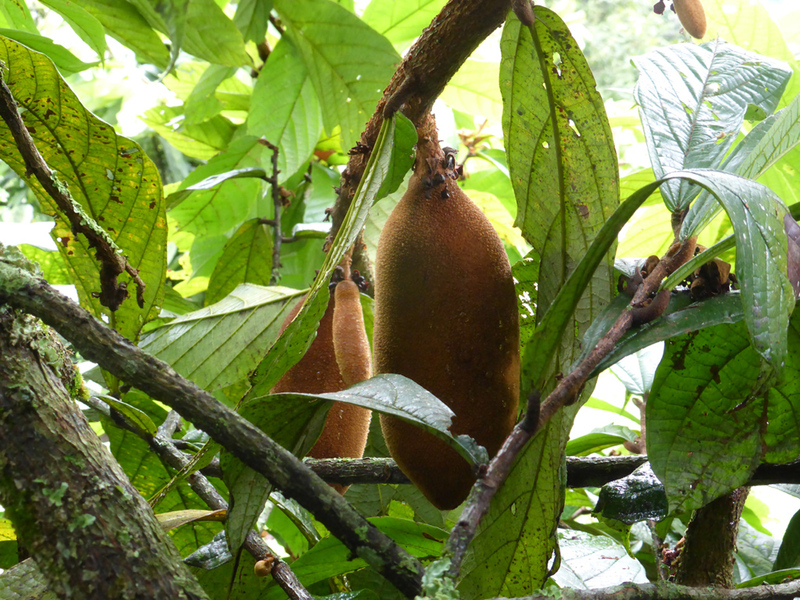 However, the curious-looking, droopy, velvety brown 20-cm-long fruits are also fragrant and I’m not sure which aroma drifting around the trees was which. Various web sites trumpet the nutritional properties and medicinal benefits of copoazú (also: cupuaçu, cupuassu, cupuazú, cupu assu, and copoasu). The creamy flesh evidently smells of chocolate and pineapple, and tastes of pear, banana, pineapple and mango peel (I’m sure people who are familiar with this fruit will weigh in with opinions). Copoazú is used in cosmetics manufacture and for supplements, but is primarly used by local people for juices and to flavour ice cream. See the Wikipedia entry on copoazú for more images and information. I have been in love with this fruit for 30 years but have eaten it only rarely since – in my opinion – it is best eaten fresh as a “pudding” or ice cream. I was introduced to both while in the Amazon three decades ago. Thank you for posting such beautiful pictures of the plant. It is nice to have an excuse to pause during my review and responses to various emails, my eye caught by the word Theobroma and recall such deliciousness. I have been growing these for years and hope someday to figure out why. I guess cupuaçu had me at ‘related to chocolate’, as well. I really like the flavor of the fresh fruit- lemony, sweet and tart, very citrusy- but timing when it is at peak is…dicey. The ones that fall to the ground start to ferment and develop a heavy alcohol aroma that has its own charms but down the road, I will hand these to chefs and see where their imagination takes them. The flowers are cool! Fabulous photos, especially the flower. So interesting to learn about a new (to me) fruit. Thanks.